In 2017 the Food Bank distributed over a million pounds of food and we can’t do it without you! Your donations make an enormous difference in the amount and variety of foods available for our clients. We appreciate monetary donations as well. Our food industry partners offer us significant purchasing power on large orders that supplement our food supply. Financial contributions are our biggest need. We provide hunger relief and assistance to an average 210 families each week, just over 31,800 individuals per year. The money you donate will help fund these essential services in addition to the daily operations of the Food Bank. 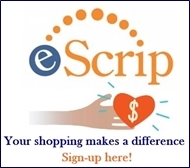 Click here to donate online. Non-perishable food donations are limited only by your creativity. We accept everything from canned goods to coffee and peanut butter to pasta. Perishable donations of dairy, meat and frozen items can be made during our operating hours. We strive to meet the needs of clients with special diets. Donations of gluten-free, low-sodium, sugar-free and soy items are always welcome. There is no such thing as too much zucchini. We gladly accept your freshly grown produce; beans, lettuce, potatoes, squash, zucchini etc. Plant an extra row next year and help provide nutritious meal options for our clients. -Diapers, formula and food. If you have an open bag of diapers from a baby transitioning into a larger size, we will happily put them to use. -Help provide for our client’s four-legged family members. Open bags of dry food are fine because we re-portion the food into pet friendly servings. A complete list of our programs can be found here. Our clients are in need of more than food alone. Donations of toiletries like toothpaste, deodorant, toilet paper and feminine products help supply their basic everyday needs. Did you know Amazon Smile will make a charitable contribution to help feed the hungry in our community every time you shop? 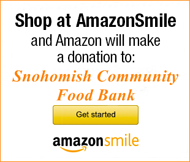 All you have to do is sign up and select Snohomish Community Food Bank as your recipient. Thank you for choosing us! Amazon Smile You Shop, Amazon Gives. Labels for Education and Box Top for Education labels are a great way to stretch your gift. We meticulously scour your donations for these labels and last year we collected over 20,000 for the Snohomish School District. In 2014, Food Lifeline recognized us with their Excellence In Collaboration Award for our label collection program. In addition to food, please consider donating items for the everyday operations of the Food Bank. Office supplies (especially 3 x 3 yellow post-it notes), printer paper, cleaning supplies and coloring books for our children’s activity room are needed. Small paper bags and produce bags will be put to good use by our dedicated produce team who sort and repackage bulk items into family size servings. We are always in need of plastic grocery bags so clients can take their groceries home. Over the course of one week we can go through 800 bags. Although we are not able to accept clothing, Christ the King Community Church (360) 568-7271 provides clothing to people in need.